As I traveled around the province this fall, knitting was my constant travel companion. The easiest travel knitting project for me is socks. They don’t take much space and I have the pattern for them memorized. Just pick the needles, some fun yarn, and I am on my way. But I have found a way to get around SSS. Here is my cure. My technique for combating SSS is to knit the socks at the same time. And this is how I do it. First, I knit the cuff section for sock #1. Then I get another set of needles and I start another sock and knit the cuff section for #2. Then I do the leg portion for #1 and then the leg for #2 once that first one is complete. I keep moving along, doing one section at a time on the first sock, and then that same section on the second sock. If I am working from a large ball of yarn, the yarn for one sock comes from the outside of the ball, the other from the centre. There are many advantages for knitting socks this way. Often I don’t work with a pattern. I just have the basics in my head. But I do need to remember how many stitches I cast on, how long each section is, how I turned the heel, and how many stitches I picked up after I turned the heel. These things are difficult to hold in your head if you make a full sock and then move the other one. Especially if a week or two (or several months) pass before you get started on the second one. When I do one section after another, I can easily see what I’ve done. And for the more finicky things like turning the heel, or picking up the stitches, I can quickly do them back-to-back. Another big advantage is the true sense of progress. 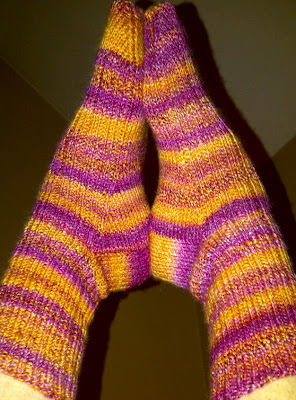 After all, you are making a PAIR of socks, why not see progress on the PAIR as you go along? And while it is possible to abandon one sock and never make the second one – I have a few examples that could prove this point, I have found it difficult, if not impossible to abandon 1/2 knit socks in progress. The final reason that really sold me is this: when you have finished the toe on the first one, you then move onto the toe on the second one. That’s the stage I was at in the above photo. After that, all you have left to do is the Kitchener stitch on both and weaving in the ends. And you have a pair of socks. Complete. Doesn’t get much better than that. This entry was posted in socks on December 18, 2014 by DianaTwiss. At the Langley Weavers and Spinners Guild Annual Artisan Sale I sold my Candygram socks to a fellow artisan. Similarly inspired by the colours in the socks she bought, she asked me if I ever worked on commission. So she showed me this photo of Turkey Tail Fungus that caught her attention. It’s pretty amazing stuff in terms of colors and shapes. So I agreed to try to recreate this look and feel into a pair of socks. Crazy challenge in some ways, but so weird and wonderful why not try? I have a few strategies at hand. Plan A: easiest one is to over dye a pair a pair of socks that I have on hand. They are pink, orange and yellow – with an over dye of indigo they may just give me the look I’m after. Plan B: spin a braid of Sweet Georgia Yarns “Bourbon” but add some burgundy and white bits. Lots of work to spin, ply and knit. But will certainly do the trick. Plan C: . . . hasn’t been thought through yet. That will involve space dyeing a skein of sock yarn that will do wonderful striping. But that’s Plan C. And we hardly ever get to Plan C right? But then as I write this and think it through, there is also the wonderful curly element that needs to be considered. I must hit the pattern books to find the right way to describe this. I may even need a Plan D for this project. Thanks Dawn for the challenge! This entry was posted in knitting, socks, spinning, Turkey Tail Fungus on November 22, 2014 by DianaTwiss. Here they are — and I never struggled with SSS (second-sock syndrome). They were fun and easy to knit. I like the way the yarn striped throughout. I couldn’t have planned it better if I had wanted to. I like everything about these socks. The only thing I’d do differently is I’d make them a bit longer. I had a enough yarn left over, that I could have added another 1 inch on the cuff. That’s why I am learning how to make socks from the toe-up — so I can be a better judge of how much yarn is left. They certainly aren’t identical, but they definitely are a matching pair. 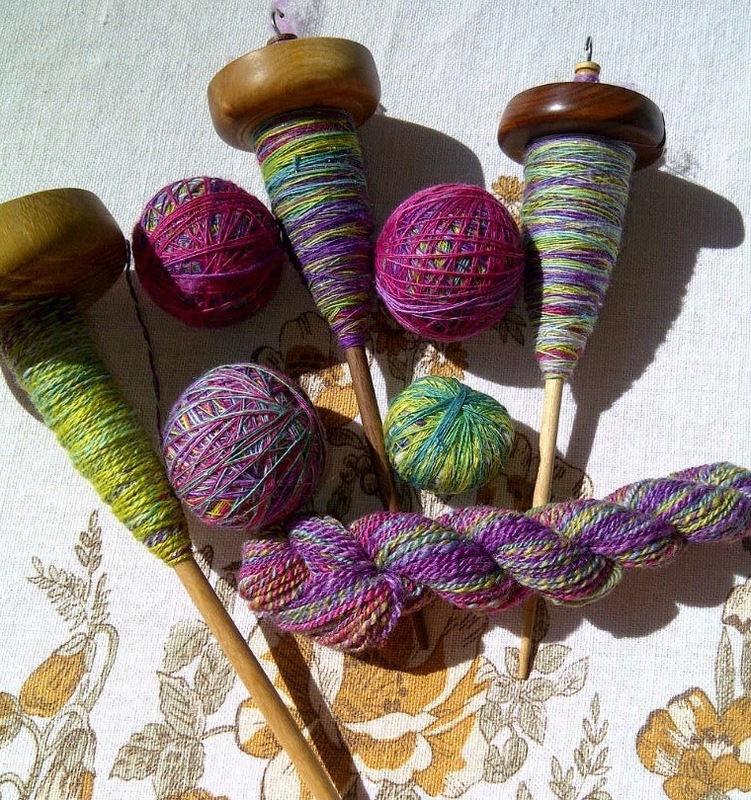 This entry was posted in socks, spinning, Sweet Georgia Yarns on May 27, 2012 by DianaTwiss. The last post featured the overspun skein of wool/silk blend from Sweet Georgia Yarns fibre club. It is proving to be wonderful yarn for knitting up socks. Here they are. On 2.5 needles with 54 stitches. I like the way the colour ways are doing a bit of striping and no pooling. It’s going to be a terrific pair, hope to have them done in time for FibresWest so I can show them to Felicia Lo myself. Must stay focused and not fall victim to SSS — second sock syndrome. There’s a steady rain outside and since I’m averse to housework, there’s nothing to do indoors ‘cept knit, spin and play with fibre. It’s going to be a good weekend. 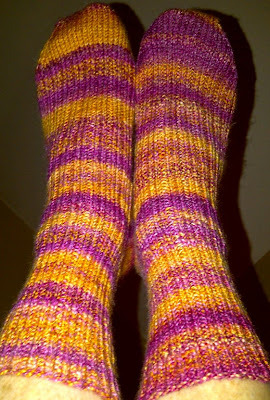 This entry was posted in fibre club, handspun yarn, socks, Sweet Georgia Yarns on March 10, 2012 by DianaTwiss.